IPCW headlights are some of the best aftermarket headlights on the market today. Their precise engineering, fanatical attention to detail, and unmatched fit and finish all contribute to their success in the automotive aftermarket. All of IPCW's headlight manufacturing is done in house. Consequently, IPCW headlights look better, fit better, and the gaskets seal better. 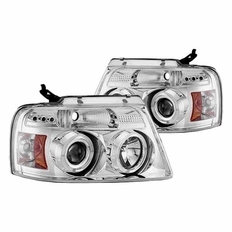 IPCW Headlights are also fully compliant with FMVSS-108/DOT/SAE requirements. Simply put, if we would not install those lights on our own personal vehicles, we would never sell them. All in all, IPCW headlight are a superbly engineered product that you'll enjoy for years to come. The part number for this item is: CWS-538C2 and it fits 2004-2008 Ford F150 models.